Okada Tasuku was commissioned an infantry officer in 1911 and was a graduate of the War College. He served as assistant military attaché in England and as aide-de-camp to Prince Kotohito Kanin. 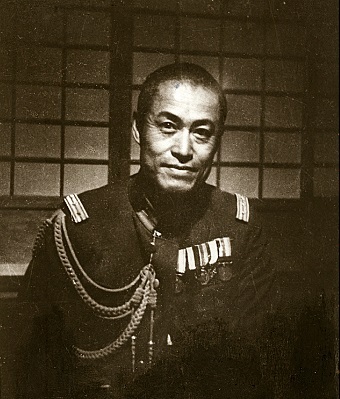 He was chief of Sagami Army Arsenal when war broke out in the Pacific, and was given command of 2 Tank Division in September 1942. In February 1945 he was given command of 13 Area Army (Nagoya) for the final homeland defense. Okada was hanged for ordering the execution of 38 American aircrew in June and July 1945. This trial has been very generous in its proceedings. I firmly believe that my feelings of gratitude will be the basis of a spiritual bond between the elder brother, America, and the younger brother, Japan, uniting our two countries in the future.